Litmus & Churchmarketplace - a collaboration to benefit Members? 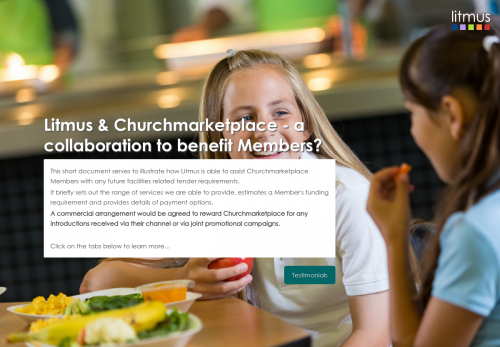 This short document serves to illustrate how Litmus is able to assist Churchmarketplace Members with any future facilities related tender requirements. It briefly sets out the range of services we are able to provide, estimates a Member's funding requirement and provides details of payment options. A commercial arrangement would be agreed to reward Churchmarketplace for any introductions received via their channel or via joint promotional campaigns.